Ok, I admit it. I am weird. I do NOT like chocolate chip cookie dough. Never have. I love chocolate chip cookies, but the unbaked dough is gross. But, that being said, I'm in the minority in this household, so I had my 3 guys begging me to make these after they spotted the recipe on Pinterest. I think everyone knows the warnings about eating raw cookie dough, because of the uncooked eggs. Fortunately, these use sweetened condensed milk as a liquid replacement for the eggs, but they DO contain uncooked *flour* which has recently become a bit of an issue, too. So eat at your own risk, cookie dough lovers. ** I use the pound-plus bars from Trader Joes or the Ghiradelli chocolate wafers available at my local grocery store. In a bowl combine butter and sugar on medium-high speed until light and fluffy, about 2 minutes. Beat in the flour, sweetened condensed milk and vanilla until incorporated, beating well after each addition. Cover with plastic wrap and refrigerate for approx 1 hour, or until firm enough to handle. Place on paper-lined baking sheets. Loosely cover and refrigerate for about 20 minutes or until firm again. In a bowl, melt dark chocolate candy coating either by placing atop barely simmering water as a double boiler or by microwaving according to package directions. I got tired of dipping truffles about halfway through, so you might consider doing this in batches, depending on how much time you have. Dip the cookie dough balls into the chocolate and place on parchment paper. I use a fork to dip and gently shake the excess off before placing on the parchment. Let the truffles sit until hard, about 15 minutes. Once set, remelt remaining candy coating. 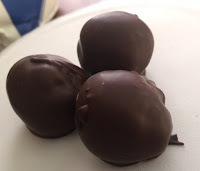 Carefully drizzle chocolate over truffles either by using a ziplock baggie with a tip snipped off or by dipping a fork and gently shaking it about 2 inches above the truffles. As you can see by the fancy picture, I didn't bother with that part this time. They still tasted fine according to the boys. Store in the refrigerator and serve cold. These can also be frozen for longer storage.